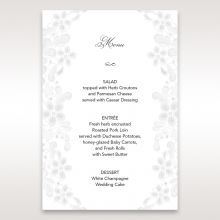 For an invitation with a feminine touch, try this exquisite gate fold card. 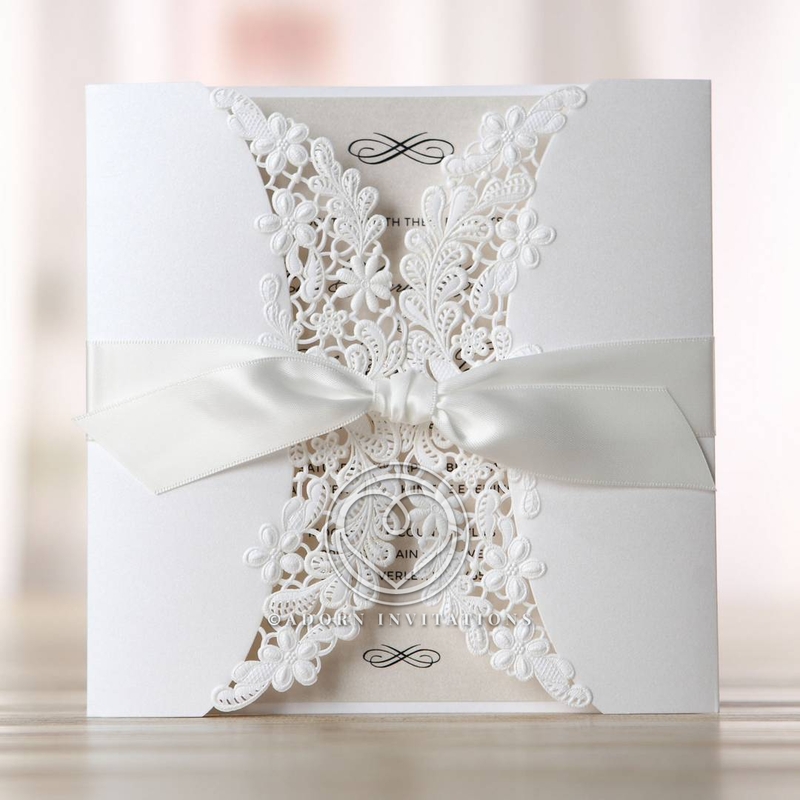 The inner edges of the fold are laser cut and embossed with an intricate floral and lace pattern. The card is wrapped with a pure white satin ribbon. Guests open the card to reveal the wedding details within. 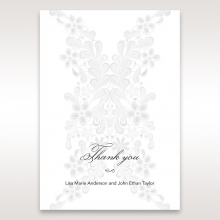 The outer card is white pearl finished high quality card stock. 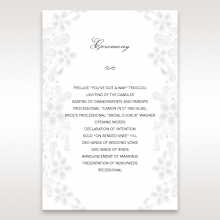 The insert with wedding details is your choice of colors. Details are printed in raised ink. 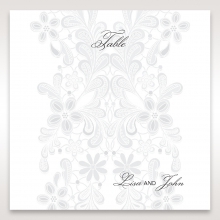 The coordinating Stationery Suite features a watermark of the beautiful floral design found on the cover. All text, fonts and the layout are fully customizable. 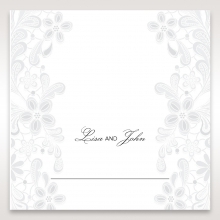 Cover PAPER: White Embossed Pearl 230 GSM. Not Customisable. This invitation was by far my favorite of all of the invitations I have seen from this sight and others. It is well made, had very clean laser design and it felt substantial in your hand. 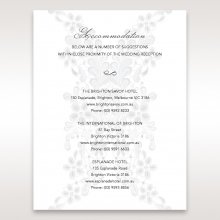 This invitation exudes elegance. The satin bow is the perfect closure for this invitation by bringing a softness. I also liked that you have the choice of what paper you want inside, we are able to order it to coordinate with our wedding colors. 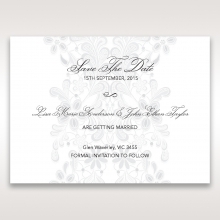 Best website to design your wedding invitations. Very elegant and affordable. I truly recommend it. I absolutely loved this invitation! Its beautifully made and the laser cutting on the paper didn't even burn the paper which I love. All the ones I have found are burned. I am really pleased with my order. I just love the design and the quality is absolutely fabulous. I had ordered many samples from other invitation companies online but none of them uses papers like B wedding invitations. 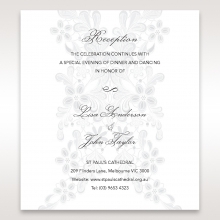 These are really high quality invitations at good prices. I’ve been showing them to my friends and they all want to order their invitations here. This invitations were elegant and beautiful. They were the perfect statement we wanted for our wedding. They were well made of quality paper and the laser cutting was perfect! I wasn’t sure about ordering wedding invitations online until I got a sample and realized this is an exceptional wedding invitation. The quality is surprisingly good. The thick pearlized papers with best printing work. 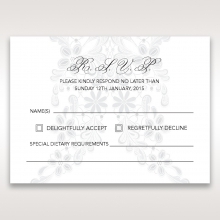 I’m currently considering other designs, but will definitely order my invitations here. I recommend everyone to get a sample to see the real quality of thse invitations. I am so pleased with the way my invitations turned out.It is really unique and special. I only sent parts of the invitations but received lots of compliments already. The glossy papers, formal jacket and the seal, response and direction cards in the pocket make the whole bundle exceptionally chic. 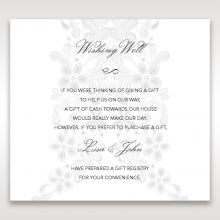 I highly recommend this product to anyone looking at purchasing wedding invitations online. I received my invitations a few days ago and was overwhelmed by the high quality. Doulble layers really make the card durable. I like all three colors but ordered blue since our wedding is in August and I wanted cool color to remind the ocean. My fiance really likes it. Ordering from Bweddinginvitatons was the best thing.